Demon’s Souls (PS3) – The infamously difficult action-RPG. As at the end of the first level, it’s actually much less difficult than I was expecting – it’s certainly less frustrating than the opening sections of God Hand or The Witcher 2. It helps that I’m using a walkthrough and playing as the easiest starting class, whose ranged magic attack can OHKO most of the first level’s enemies. This doesn’t mean it’s easy. My magic takes time to lock on and cast, which leaves me vulnerable to being swarmed in close quarters; if you let attacks get past your shield or fail to dodge, you can die in a few solid hits; and if that happens, there’s the loss of time from having to replay swathes of a stage*. The one boss fight that I did was actually really cool: I ran from cover to cover taking pot shots, realised my approach wasn’t working, then pulled my sword and CHARGED! – what a thrill that was. The online aspects of the game are also nifty – you can see ghostly outlines of other players, which once alerted me to an ambush (the ghost ran past a corner, then raised its sword to attack a foe I hadn’t seen), and touching bloodstains will let you see others’ last moments. I’m not sure how much more time I can spare for this game, but the first few hours were worth it. * You can unlock shortcuts that allow you to bypass chunks of a level if you have to restart; however, there will still be some need to clear out respawned foes. Bastion (PC) – Indie isometric action-RPG. I estimate I’m around halfway through, and so far, I’d consider this good but unspectacular. The game’s world is imaginative, colourfully drawn and fleshed out by omnipresent narration. Each stage feels distinct, both from an art and a gameplay perspective – some will involve a fairly long Macguffin hunt, in some you’ll find your Macguffin early but then have to flee a gauntlet of foes, and others steadily ramp up to boss battles. The combat feels fluid, as you alternate use of your shield, your various weapons, and manoeuvre. The difficulty level feels right – the mandatory stages start out reasonably easy (you can up the difficulty if you choose – I haven’t done so) while the optional stages are geared towards players who want a challenge. Yet, and this is very subjective, nothing so far has stood out enough for to consider the game “great”. I’m probably going to reserve this for when I’m too tired to play more involved titles. Half-Minute Hero (PSP) – Now this is a clever concept. The flagship gameplay mode, “Hero 30”, is an 8-bit RPG boiled down into 30-second stages – level up, shop for better gear, recruit NPC allies, and then head for the boss’s lair! In practice, you’ll need more time than that, which is where one of the game’s key mechanics, paying the Goddess of Time to reset the clock, comes into play. As such, the challenge in each stage revolves around finding the right balance (on the fly!) between grinding, tackling the stage-specific challenges, allocating money between the Goddess, equipment, or other NPCs, and leaving enough time to reach the boss. A few hours in, I like its fast pace, I like its sense of humour, and just as with Recettear and Frozen Synapse, I like its original premise, and I’m already looking forward to the sequel (coming to Europe in October). As you can see above, most of my previous discussion of Persona 3: Portable has focused on one half of the gameplay: the social/high school life simulation. But what about the other half of the game, the dungeon crawl? You’ll tackle Tartarus, the game’s dungeon, one randomly generated floor at a time. Each floor may contain chests or a portal out. It will contain the staircase leading to the next — and it will almost certainly contain groups of monsters, depicted as black blobs that wander about the dungeon floor. Bumping into these blobs will trigger a battle (no annoying random battles here, thank heavens!). They’ll chase you if you come within their sight, and if they run into you, odds are the monsters will get the first turn in the resulting battle… but strike a blob with your weapon, which is easier if you sneak up from behind, and you’ll move first. Once combat begins, it looks like your typical menu-driven, turn-based JRPG: each party member* can attack, defend, use the special powers conferred by his/her inner spirit, the titular Persona, etc. Unique in the party, the main character can switch between different Personas, each with different strengths, weaknesses and powers; other party members are stuck with just the one set of abilities. The twist to this system is the critical importance of targeting vulnerabilities. Attacks in the game are divided into nine types — Pierce, Slash, Fire, Electricity, Light, etc — and different party members, and different enemies, are weak against different types of attack. If a combatant is struck by an attack that targets his/her weakness, the resulting critical hit will knock him/her/it flat. And every time a foe is knocked down, the attacker will get an extra turn. Finally, if all monsters are knocked down, the party can launch a devastating “all-out attack”. The significance of this is that the game encourages you to chain multiple critical hits in the same turn, culminating in an all-out attack. So if you get in the first move — remember, by striking monsters with your weapon on the dungeon map — and the party has the right damage types at its disposal, you can go through trash mobs like Clint Eastwood in a spaghetti western, where he could pull his gun and mow down three bandits before they even blinked. Conversely, if the monsters move first and they’re especially powerful, or you’re especially unlucky, it’s possible to wipe in a single volley of queued critical hits (luckily, monsters can’t launch all-out attacks…). For most fights, this system works very well. It pushes you to prepare for battle by using a well-balanced party and keeping a varied selection of Personas on hand. It means there’s a bit of tension on the dungeon map, as you take care to sneak up on monsters, or conversely run like blazes to avoid having the monsters run into you. And given the number of trash mobs you’ll fight, it keeps ordinary battles moving at a good, brisk pace. Where this system doesn’t work so well is in boss battles. It takes a long time to defeat the typical boss monster, and a simple, elegant system built for speed is not well suited for protracted pounding matches. My boss fights tend to turn into repetition of the same pattern of moves over and over – A attacks, B buffs then attacks, C debuffs then attacks, D heals. And as a result, I am often all too glad when boss fights are over. 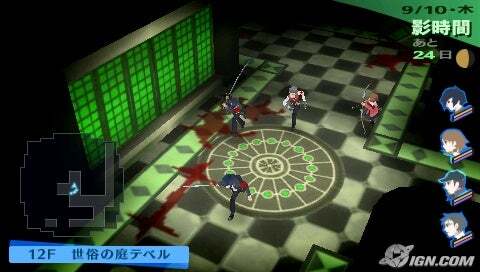 Still, on the whole, I like Persona 3: Portable’s battle system. It’s not every boss fight that stretches on for too long. And even those that do are outweighed by the fun I have as I tear through the game’s ordinary encounters. * This is a change from the PS2 version, in which you only directly controlled the main character — your party members had their own AI. This is the fifth post in my series on Tactics Ogre. Check out my earlier impressions of the game’s character profiles; four things it does better than FFT (and one it doesn’t); how I used different character classes in battle; and an unfortunate mishap later in the game. Tactics Ogre: Let Us Cling Together, the 2011 PSP remake of the SNES/Playstation tactical RPG, is a labour of love, and it shows wherever you look. It shows in the game’s beautiful character designs and in its soundtrack, performed by an orchestra even though players might only hear it through the tinny speakers of the PSP. It shows in the sweep of the game’s plot; in the natural sound of its mock-Shakespearean localised dialogue; in the lovingly written character profiles given to even spear carriers; and in the fluff text accompanying every bit of terrain. And it shows in features such as what is, effectively, an in-battle autosave; a perspective that can switch from top-down to isometric; and the ability to jump straight to important points in the game’s timeline during a replay instead of having to redo everything from scratch, all of which speak to thought and effort put into eliminating annoyances. Most importantly, the basic in-game task, moving party members around on the grid so they can attack or use their special abilities, feels satisfying. The balance between offence and defence feels just right – blows do enough damage (generally, squishies will crumple after a few good hits, whereas heavily armoured warriors can keep fighting for longer) to keep things moving quickly and maintain tension, but not so much damage as to turn the game into an exercise in luck or frustration. Positioning matters, too: archers can shoot farther from the high ground; front-line fighters project zones of control to prevent enemies from rushing past to the weaker characters; wizards may be unable to cast spells if friendlies are in the way. In between battles, you’ll choose classes and skills for your party members – in broad terms, knights tank; archers and ninja are the main damage-dealers; and mages are used for debuffs and crowd control. Archers in particular are devastating, but as not even the mightiest archer will be able to stand unsupported, it remains important to maintain a good mix of party members*. And here, the gameplay’s main flaw reveals itself – the levelling system fails to eliminate grinding. All characters of the same class will share a level, and switching classes will change a character’s level. This works better than the traditional system found in, say, Final Fantasy Tactics, since now you only need to level a class once. Unfortunately, not only do you still need to level newly unlocked classes (of which there are quite a few) from scratch, high-level NPCs in new classes will revert back to level 1 when they join the party! By the end of the game, I was leaving even interesting-sounding new party members on the bench, because my patience for grinding had run out. And that is a frustratingly imperfect element of the system. As a storytelling experience, Tactics Ogre reaches for greatness, but doesn’t quite get there. This is not because its creators were untalented or unimaginative. Instead of a stew of quest fantasy clichés, they attempted to give us a tale of ambition, compromise, loyalty, and love, set in a land riven by feuding pretenders – “A Game of Thrones” for the JRPG genre, if you would. The player’s choices will then drive that story down one of three branches that recombine for the game’s final act. At times, this works very well. Some individual moments, in their injustice, left me shocked and appalled. In another scene, a tyrant sounds all too human, all too real, as he attempts to rationalise his misdeeds. And a dying foe might show a hint of nobility that leaves the question of what could have been. At other times, it doesn’t. One of the two storylines I played is noticeably better than the other, which is more black-and-white and doesn’t hang together very well. Once the storylines do recombine, the plot feels rushed: key characters act on inconsistent or poorly explained motivations, some of the later twists and turns pop up out of nowhere, and good luck getting the desired outcome from one vital story decision without a FAQ. And characterisation of party members suffers as a result of the gameplay format. There are dozens of potentially recruitable characters, so they can’t be given much time in cut-scenes. (While party members do influence the ending, you can only see one character’s epilogue per game, an incomprehensible hold-over from the Playstation version and a noticeable flaw compared to Valkyria Chronicles, a game that was far inferior story-wise.) Party members do get in-battle dialogue, but consistent with other TRPGs, there’s no ability to talk to them in between battles. And this is a pity, because the one brief scene I saw where several party members hang out in town, bantering and enjoying everyday life, was done so well that I’d have loved more moments like that. All in all, Tactics Ogre is a very good game, and close to the borderline with greatness. Gameplay-wise, this is the highly polished epitome of turn/party-based combat, for all it ends up too grindy as it wears on. And story-wise, while it suffers from flawed execution, it aims high enough, and gets enough right, to leave me glad that I played it. If you like turn- and party-based RPGs, and you have a PSP, I would recommend this game. * I’ve seen the point made elsewhere on the internet (on a forum or by another reviewer? I can’t quite remember) that this is in contrast to Final Fantasy Tactics, where the key was mixing and matching class abilities to create unstoppable characters. You can buy Tactics Ogre: Let Us Cling Together from Amazon here. Time spent with the game: My playtime clocked in at around 80 hours, though there would have been times when I’d left the game on (either on AI control, or completely idle) while I did something else. What I have played: The Chaos route, most of the Law route, the good ending, the first few minutes of the postgame. What I haven’t played: The last few battles of the Law route, the Neutral route, most of the postgame content. Compared to other RPGs, Persona 3’s modern-day world may seem mundane. The main character buys healing items not from armourers and apothecaries, but from the pharmacist at the shopping mall. He/she traipses through school hallways rather than half-sunken temples or bridges in the sky, and his/her haunt is the dormitory lounge rather than a castle. But there are a couple of twists. First, Persona 3 is set in modern-day Japan, and to a Western gamer, odds are that will be at least a little exotic. The game takes place in the big city, so many of the differences will be muted. But there are some you’ll notice straight away. The dialogue is laden with “-san”, “-kun” and other Japanese honorifics. The main character can pray at a Shinto shrine, either to boost Academics before an exam, or divine his/her fortune and strengthen a relationship. School clubs are a Big Deal. There are even love hotels. Second, Persona 3 contains a bunch of little touches that help preserve the internal consistency of that setting, and hence, the player’s suspension of disbelief. Trees change colour in between seasons. NPCs change their outfits depending on the weather and on whether they had school that day. But for something a bit more substantive, take the game’s scheduled exams, two sets a semester. They form part of the time management aspects of the game. They’re well flagged, in dialogue and on the in-game calendar. They do have an in-game effect. And so, it makes perfect sense that right before exam-time, your party members lock themselves in their rooms to study – leaving them unavailable for dungeon-crawling. That said, Persona 3 mostly limits you to a single city, unlike the typical RPG, which has you travelling across cities and continents. While this is also consistent with the game’s premise – most high school students stay put in one place – it does mean that this isn’t really a game about the joy of exploration. Still, when the characters do get out of town, on holiday or on school excursions, the destinations are well-realised enough for me to delight in running around and talking to every NPC – and they’re also host to some of the funniest scenes in the game*. * Which, I suspect, owe more to anime tropes than to real-life Japanese culture. Roleplaying and time management in Persona 3 Portable: Who says there’s no roleplaying in JRPGs? As far as I can tell, the core of Persona 3 (refer to my initial post for the premise of the game) is its dungeon-crawling RPG combat. From a min-maxing perspective, the other, social aspects of the game ultimately seem to boil down to the bonuses they confer in the RPG element*. Even raising the main character’s stats by studying, singing karaoke or going to trendy coffeeshops will ultimately affect his/her ability to strike up relationships with certain other characters, which in turn, affects the bonuses carried into the dungeon crawl. Note my use of “as far as I can tell” and “seem”. Except when looking up specific, narrow questions, I’ve departed from my usual RPG practice by minimising my use of FAQs for this game. And that is because Persona 3 is the most I’ve ever roleplayed in a single-player RPG. Back in my “intuitive gameplay” post, I talked about two different ways of looking at a game – as a set of rules to be mastered; or as a story to be acted out. And there is a certain tension between those two mindsets: when I can see that the “optimal” choice is grossly out of character, “unrealistic”, or ”ahistoric”, this hurts my suspension of disbelief. For Persona 3, I’ve gotten around this by simply not looking up the optimal choices. So, free from concern about min-maxing, I’ve been spending the game’s precious resource, time, in a way that best brings the “Japanese schoolkids” theme of the game to life. My main character, Arthur, raises his Academic stat by paying attention in class, praying at the local shrine in the afternoon, and studying in the evenings, not because I think it’s optimal, but because it’s what I think he would/should do. He raises his Charm because that stat will be used in his relationship with one of my favourite NPCs in the game, and if I want to see that dialogue, so does Arthur. And he spends his time with people whose company he enjoys, not necessarily those who’ll give him the most useful bonuses. (The one time powergaming concerns drove me to hang out with a NPC I found annoying, I imagined Arthur gritting his teeth and making noncommittal remarks the whole time.) It’s a liberating feeling to simply play “naturally” and focus on my favourite character interactions, without worrying about the minutiae of builds, boosts, and seeing every last bit of content! * Specifically, social links will affect the EXP/levels of your created “personas”, the spirits that do the heavy lifting for you in battle. 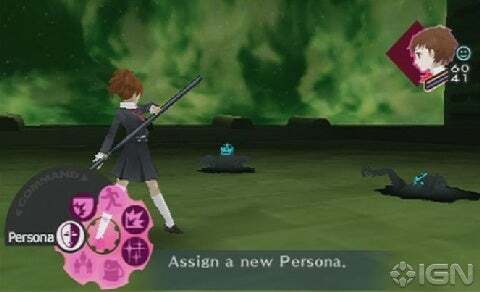 Author Peter SahuiPosted on May 20, 2011 June 3, 2012 Categories Game Diaries, Games, PSP Games, RPGsTags games, jrpgs, persona 3 portable, psp games, rpgs3 Comments on Roleplaying and time management in Persona 3 Portable: Who says there’s no roleplaying in JRPGs? Morning – Go to school. Afternoon – Hit the books. The average high schooler who thinks his/her life is in turmoil has nothing on Arthur, my name for the hero of Persona 3 Portable. It’s not just that he’s a transfer student, the new kid in school. For Arthur is one of a handful with the ability to fight the “Shadows” that rob people of their will to live, and so, despite his tender age, the fate of the town is in his hands. Not wholly in his hands, luckily. For backup, most visibly, Arthur has the schoolmates with whom he goes dungeon crawling – the friendly Yukari, Junpei the class clown, and cool older kids Akihiko and Mitsuru. They’ve proven their worth so far, Yukari with her healing and wind magic, Akihiko with his fists and lightning magic, Junpei with his whacking great two-handed sword, and Mitsuru radioing in directions and calling for backup if the team gets separated. But building social links (“S-Links”) to others will also boost Arthur’s inner powers, and there are a lot of potential friends he can make: the elderly couple who run the local bookstore, the little girl who hangs out at the shrine on Saturdays, his buddy from the kendo team, even the person he plays MMOs with on the odd Sunday. He doesn’t know anybody especially well yet, but he’s made a decent start. It’s only been a little over a month since Arthur moved into his new school and discovered his powers, but he’s settling in well. He’s aced his midsemester exams (for which Mitsuru owes him a present). He’s making a fair few new friends. And last but not least, he’s defeated several tough bosses and plenty of lesser foes. Things are looking up for our young hero – and they’re most definitely looking up for Persona 3 Portable. This is the fourth post in my series on Tactics Ogre. Check out my earlier impressions of the game’s (1) character profiles; (2) four things it does better than FFT (and one it doesn’t); (3) how I used different character classes in battle; and (5) my verdict on the game. The legend of King Arthur reaches its tragic end at the battle of Camlann, one that could have been avoided but for a stroke of ill luck. Arthur and his foe Mordred, so the story goes, sat down to negotiate. Their armies looked on, ready to pounce in the event of treachery. Sure enough, one knight pulled his sword – but it was to strike at a snake, not the king. It did not matter. The armies saw the steel, not the snake. And when it was over, Mordred was dead and Arthur lay dying. Certain events in Tactics Ogre, though far, far less drastic, reminded me of Camlann all the same. At one point in Tactics Ogre, the story calls for the main character to set off on a parley. But I didn’t do this immediately. It took me a couple of hours of real time to get around to it—for one, I had to fight another story battle, and I think I must also have spent some time grinding in random battles, crafting, or rearranging my party. Upon finally making it to the negotiations, up popped the party selection screen – the same one that comes up before every battle. “Hmm,” I thought. After all, Tactics Ogre is a tactical RPG – battles are the meat and potatoes of the gameplay. The obvious implication was that the day would end in bloodshed. So I did what I always do when I see that screen: I sent in the hero plus a full complement of party members, all of them armed like medieval Rambos. Sure enough, the resulting cut-scene showed the situation degenerating into violence. I shrugged, mowed down my foes, and moved on with the story. And then, several days later, I learned from GameFAQs that the bloodshed could have been avoided, had I sent in the hero alone and unarmed. “Wait a minute!” I thought. “How on earth was I supposed to know to do that? !” But something still bothered me. Maybe the game had given me the appropriate hint, and I’d just forgotten about it? So I went back to re-watch the cut-scene before the hero left for his ill-fated parley. And sure enough, he did say that he should go alone and unarmed. The game’s developers had indeed given me a hint about what to do, and I had indeed forgotten during the time it took me to get around to the parley. But even if I had remembered that line of dialogue, it would have been undermined by the game having conditioned me, by that point, to expect a fight after seeing the “party selection” screen. So moral of the story #1 is to reaffirm the hidden danger to taking time off from a game’s plot. Moral of the story #2 is, when gameplay mechanics train the player to do X in a given situation, designers should be wary about then expecting the player to do Y instead. This would all be small comfort to the generic enemies who lay dead in the snow. Sorry, guys, I’ll be sure to spare your lives on my next run! This is the third post in my series on Tactics Ogre. Check out my impressions of the game’s (1) character profiles; (2) four things it does better than FFT (and one it doesn’t); (4) an unfortunate mishap later in the game; and (5) my verdict on the game. In party-based RPGs, half the gameplay typically consists of combat and the other half consists of preparing for combat by designing an effective party. With its plethora of classes, skills and even non-human units, Tactics Ogre is no exception: party-building starts to feel a little like making a house out of Lego. 26+ hours in, I’ve built my team into the proverbial well-oiled machine (or should that be a Lego machine? ), complete with a standard operating procedure that handles most foes without too much trouble. The basic building blocks of my party would be familiar to any RPG player. Building block #1 is a row of heavily-armoured knights, projecting zones of control that slow enemy movement. But my real killing power lies with element #2 of my team, a row of archers. Ninjas rushing at me? Use archers to shoot them to bits before they can get off too many deadly melee attacks. Enemy knights? A little trickier due to their durability, but I’ve worn down many a level-boss knight with a rain of arrows. One battle last night momentarily took me aback. This time around the boss was a terror knight, a sinister-looking melee class that specialises in inflicting debuffs. But they trade off durability to do so, making them much more vulnerable to archers compared to plain old knights. No, the issue was the other enemies. The shock troops leading the enemy charge weren’t knights. They weren’t ninjas. They were not human at all – they were dragons. And you won’t be surprised to hear that dragons are distressingly arrow-resistant. Fortunately, I was prepared. Situations like this call for the next building block of my team: the mages whom I’ve built as debuffers par excellence. In short order, the nearest dragon was (temporarily) petrified. The second, and its javelin-lobbing handler, took a snooze. My knights and archers moved around their forms, and took up position ready for the boss. And when he came charging across the causeway, I had a mini-Agincourt waiting for him. Oh, the resulting engagement didn’t go 100% according to plan. There was a moment of panic when one of the incapacitated dragons (‘temporarily’ petrified indeed!) blasted my back-row wizard and archer with a gust of flame. But it was simple enough to put the dragon back to sleep, and after that, my archers (and one crossbowman) could return to the boss. Soon enough, it was mission accomplished, using more or less standard RPG classes and tactics. But Tactics Ogre offers more choices than just standard RPG classes and tactics. Here’s one example – that crossbowman I mentioned? He’s a member of a winged species, and his ability to fly around the battlefield makes him an indispensable party building block all by himself. On urban stages, he can just drop down on a rooftop vantage point, or get around a corner to take aim at an enemy from behind. Even in the open field, it’s invaluable to have someone who can quickly reach the mages and clerics in the enemy back line. Then there are various support classes I’d neglected at the time of that battle. One class in the game, “dragoons”, has a special anti-dragon skill, which presumably would have let me tackle the dragons head-on instead of putting them to sleep and bypassing them for the boss. But wait, why would I want to play the dragon-slayer when I could recruit the dragons? That’s exactly what another class, beast tamers, can do. Sadly, I only had one beast tamer at the time, whose level was too low to recruit dragons (and probably so low that she’d have lasted about 10 seconds on the field). But given how much hassle dragons cause me every time they show up on the enemy side, I think it’s about time I add one to my own party. There are so many more classes and units available, and I’m not even up to the endgame. Berserkers, hand-to-hand classes with a splash damage special ability, appear from the start of the game. I’m still levelling a katana-armed sword master, but so far his damage output is promising. If I added a golem to my team, it’d be well-nigh invincible against physical attacks, so that could allow it to replace my knights in the front row. Rogues… well, I’m not exactly sure what rogues do, but they’re there. Tactics Ogre gives you all these potential building blocks to play with, and more. This is the second post in my series on Tactics Ogre. Check out my impressions of the game’s (1) character profiles; (5) how I used different character classes in battle; (4) an unfortunate mishap later in the game, and (5) my verdict on the game. I came straight from a three-quarters-finished play-through of Final Fantasy Tactics: The War of the Lions to Tactics Ogre: Let Us Cling Together. And while I haven’t finished Tactics Ogre, either, I have played for long enough (15 or 16 hours) to see what Tactics Ogre does better – and what it doesn’t. How do these two classics of the tactical RPG genre stack up? 1. Class abilities make it easier to set up proper party front and back lines – The knights should be up front, the wizard and cleric should be in the back. RPG Tactics 101, right? But in FFT, there was theoretically nothing (terrain aside) to prevent making a beeline for the squishies. Now, in Tactics Ogre, certain melee classes – such as knights! – can project a one-square zone of control around themselves that prevents enemies moving past. The usefulness of this ability guarantees several knights a role in my party – and as a gameplay feature, it ensures unit positioning is of proper importance. 2. Debuffs are more practical – In FFT I rarely bother with debuffs and status effects. FFT usually requires the player to kill every enemy on the map to win the battle, and debuffs are so inaccurate, I might as well just go for a damage-dealing attack instead. Of course, there are exceptions – I wouldn’t have won certain rock-hard battles near the end of Chapter 2 in FFT had I not prevented some of the most powerful characters on the enemy team from attacking – but the general rule remains. But in Tactics Ogre, most battles are won by killing the enemy leader, and there are often horrifyingly resilient enemies (from armoured knights to dragons in the way). Solution: start dropping debuffs left, right, and centre! That dragon isn’t so scary when it’s asleep. And the debuffs’ decent chance to hit (so long as you invest in the appropriate skills) means that you can use them without frustration, or resorting to abusing the Chariot system. 3. The Chariot system reduces frustration – Tactics Ogre’s Chariot system, which allows you to rewind a battle by up to 50 turns, is basically a legitimised save/reload. Most of the time, I don’t (ab)use it. But when a story character permadies halfway through a pitched fight, then I thank heaven that I can just fire up the Chariot instead of having to restart the battle from scratch. 4. The levelling system is less grindy – Tactics Ogre’s levelling system is halfway between a classic RPG and the innovative system we saw in Valkyria Chronicles: experience is awarded on a class-wide basis, and every unit of the same class shares the same level. If you’ve ever spent time bringing Ladd, Alicia and Lavian in FFT up to the same level as the starting characters, or grinding multiple Arithmeticians, you will appreciate the Tactics Ogre system immediately. The Tactics Ogre system isn’t perfect – training a new class up from Level 1 is still a hassle, which makes me wish they had gone whole hog and adopted the Valkyria Chronicles system whereby all experience goes into a common pool, to be allocated between classes as the player sees fit – but it’s a big step forward from FFT. Now, given that Tactics Ogre’s gameplay was remastered for the PSP version whereas FFT: War of the Lions is basically a straight port with a few frills attached, it’s not terribly surprising that the former benefits. After all, both games came out in the 90s, and a lot of water has flowed since then. Map variety – Whether it’s scaling hills and rooftops in a street fight, storming a fastness, picking my way between lava flows at Mount Bervenia or crossing the forks of a river, FFT has ample map variety. In contrast, Tactics Ogre has recycled several maps so far, and several more (e.g. hilltop fortresses where you start at the base of the map and have to fight your way higher) are awfully similar. For all that, both games deliver from a gameplay perspective. Each features fast and fluid combat. In each, there’s a rush of satisfaction in first building up my characters – A learns how to be a tank par excellence, while safely behind him, B becomes a one-woman army with her bow – and then unleashing them on the battlefield. And each is good at tempting the player with just-out-of-reach toys. Right now, Tactics Ogre is making me wonder: are Ninja as good in this game as they are in FFT? What could a Witch or a Warlock do on the field of battle that my existing Wizard can’t? I look forward to finding out. This is the first post in my series on Tactics Ogre. Check out: (2) four things it does better than FFT (and one it doesn’t); (3) how I used different character classes in battle; (4) an unfortunate mishap later in the game; and (5) my verdict on the game. One hour into Tactics Ogre: Let Us Cling Together, the PSP tactical RPG, and I’m already impressed. I like its art and its music, but production values are never the be-all and end-all. Its gameplay has made a good first impression, but one hour is nowhere near enough to get a feel. And the game’s protagonist, Denam Pavel, so far is a blank slate. No, what impressed me so much was how the game fleshed out the most minor of its characters. Your very first real opponent during the game’s tutorial is Bapal the Mercenary, who threatens the heroes in decidedly non-standard English (“There’s two thousand Goth on that one’s head, boys! Half the purse to him what brings him down!”) and who claims to know “a man from [your homeland] when I see one!”… only to completely mis-identify the person he’s referring to. I wrote him off as a none-too-bright thug – suitable fodder for a tutorial battle – and soon enough, my NPC allies wrote him off the face of the earth. Next up is a knight named Sir Agares, who blusters about “rebel swine” and how “a craven who would choose lucre over loyalty deserves only one reward”. I dismissed Agares as a pompous fool, and sent him to join his mercenary compatriot. Once the battles were over, and I was back on the world map, I took a look at the in-game character profiles. There were heroes and heroines, lords and kings and knights. And right at the bottom, there were entries for Bapal and Agares. Hmm, what could they say? At the start of the war he led a group of bandits based in the Phorampa Wildwood, but a desire to defend his homeland prompted him to enlist as a man-at-arms. Though an experienced fighter, he lacked an understanding of the art of warfare, and was often mocked by other soldiers. In an attempt to prove himself, he led an offensive against partisans at Almorica Castle. Fodder for a tutorial battle, yes, but now Bapal seemed more pathetic than contemptible. What about Agares? He was brother to Baronet Bazin of Auslan, a town in the Coritanae marches. Sir Agares was sent to reinforce the Almorica garrison, who were struggling to hold off attacks by the Duke’s men. Despite his noble upbringing, he was an approachable and well-respected commander. I did not feel quite so smug after reading that. He was the son of renowned architect Selba Brondel. Selba created many famed buildings, such as Hellingham Palace, also known as the Hanging Gardens. Orba taught at the Coritanae Academy of Arts while painting numerous works in his spare time. One of these, named ‘Opalescent Clouds,’ was presented to the late King Dorgalua and now hangs in Helm Castle. Now, from the viewpoint of the player and the heroes, these characters are utter non-entities. From a gameplay perspective, their only function is to give you a not-particularly-tough leader to target in each battle. From a plot perspective, they may as well have been nameless red shirts: they appear once each, get two or three lines, and then die at the player’s hands. You can play the game without ever needing to learn about Orba’s hobby for painting or the esteem in which Agares’ soldiers held him. But these characters do matter to the overall storytelling experience. Take the time to read the profiles, and you’ll discover three patriots willing to fight for their country, who lived three distinct lives to varying degrees of fulfilment – ex-bandit, lordling, amateur but accomplished painter – until the respective days they met Denam Pavel. From a thematic perspective, this serves two purposes. One, it reinforces that each of us is the hero of our own story. And two, it’s a subtle way to hint at the pity of war, which brings those stories to such sudden ends. (I strongly suspect that the tragedy of war will end up being a major theme, in which case this is one way the game brings it across.) Not too bad, for a bunch of one-off foes who don’t even get their own character artwork! My hat is off to the game’s creators for their attention to detail here, and I have high hopes that the rest of the game will live up to this promising first impression. To my pleasant surprise, Square Enix has announced that Tactics Ogre for PSP will come out in Europe on 25 February, a little over a month away and only ten days after its US release. (press release courtesy of Gamershell). As an added bonus, it’ll come in a “premium edition” with an artbook and a mini-soundtrack CD. As I plan to import the game from a UK retailer (assuming, of course, favourable reviews and/or word of mouth), it’s encouraging to hear I won’t have to wait too long. 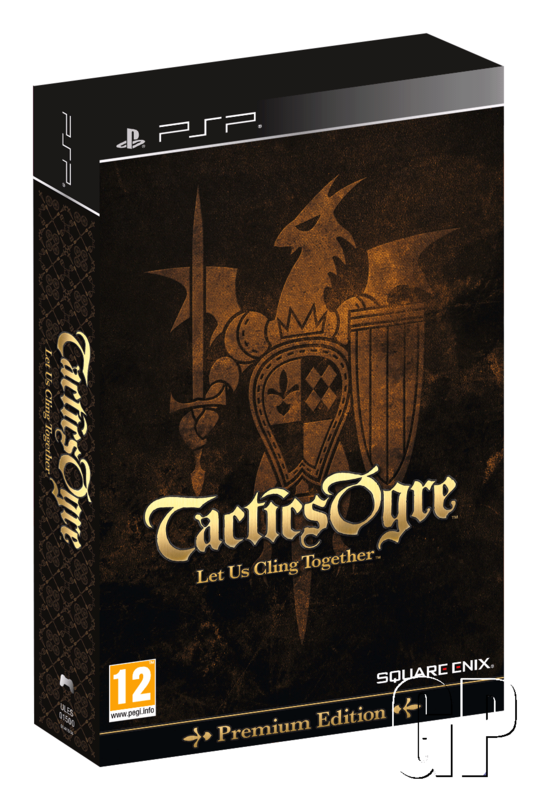 Square Enix has scheduled the US release of Tactics Ogre: Let Us Cling Together (PSP) for 15 February! A quick Google search couldn’t turn up any information on a European or PAL release date, but hopefully it will follow shortly thereafter. I look forward to the release! There is now a trailer available for the forthcoming PSP remake of Tactics Ogre. Apparently, it’s a translation of a trailer that was showed at TGS. The actual in-game dialogue in the trailer is still in Japanese, so no glimpses, as of yet, of how dialogue will be localised. However, it looks like the PSP remake has done an FFT and renamed the characters; the surnames in particular sound now more Central or Eastern European (Denim Powell -> Denam Pavel, Kachua Powell -> Catiua Pavel). I’m looking forward to this game when it eventually comes out in the West; Tactics Ogre has a sainted reputation in the TRPG genre and I liked what I’ve played of it, despite its brutal character permadeath. Hopefully the re-release won’t disappoint. Famitsu magazine has confirmed we’ll see a Valkyria Chronicles 3, apparently for the PSP. On the one hand, I’m glad: the world can always use more TRPGs, and I love the hands-on unit control that is the selling point of the VC series. Running a soldier out of harm’s way or lining up a shot with the joystick adds so much to the experience, compared to the “click on square to move, click on rifle, click on target” of other games in the genre. But on the other hand, I do wonder if they’ll address two of the glaring gameplay issues with the original game. (Note: I have not played VC2 beyond the demo, so I only have word of mouth to rely on with regard to that game, and I can’t testify as to whether these issues have already been fixed.) First are the balance issues, :an overpowered class, scouts, and such as overpowered unit buffs. Second, and linked to the first, is the game’s scoring system, which is dominated by the speed taken to finish a level. The combined effect of the two is that, while the first game gave us so many tactical tools to play with – five classes, two tanks that could be customised, support weapons ranging from flamethrowers to rifle-grenades – it rewarded a madcap dash by your scouts for the other side’s flag. Now, this was not a game-breaker for me. I really enjoyed VC nonetheless; I could regularly post decent (if unspectacular) scores by playing a methodical, combined-arms game; and I treated the speed-driven scoring system as a fun way to challenge myself when I replayed levels in skirmish mode. But a flaw is a flaw, and anecdotally there were people who were bothered far more than I. However, the interesting thing is the development team’s rationale for focusing on speed. You can see it on page 3 of this Gamasutra interview. My interpretation is, the developers wanted you to take a ruthless, damn-the-casualties approach to promptly achieving your objectives. This is a good, or at least an interesting, idea on paper. In practice, it falls flat for the reasons discussed above. But there’s one more design feature which obviates the need to even be ruthless in the first place. Similarly to Final Fantasy Tactics, VC gives you a three-turn grace period to call in a medic for a fallen party member before he or she is killed off for good. Story characters escape even more lightly – they’re simply immune to perma-death. There are exceptions – if an enemy soldier reaches your fallen squaddie first, that will also lead to perma-death*. But by and large, this is no X-Com, a game where horrific casualty rates were the price that had to be paid for defending Earth against a technologically superior, vastly powerful foe. And while I certainly appreciate the fact that VC is a pretty forgiving game, it does undermine what appears to have been a goal of the designers.